The importance of saying "I'm sorry." Let me start out by saying that I'm a customer of Bank of America's (NYSE:BAC), and a largely happy one at that. During the past few years, it's treated me and my wife well. We've had some issues with it, but as best as I can remember, they were all resolved satisfactorily after short, though sometimes aggravating, phone calls. So, when I say that Bank of America needs to win me back, I'm not referring to my personal life. I'm referring instead to my professional life, as a financial writer who covers banks. During the last few years, I've tracked Bank of America's laundry list of misdeeds. It's been an eye-opening exercise. When you combine the volume of its malfeasance during the past decade with the patently offensive nature of some of it, it leaves you shaking your head about how a company like that could stay afloat. But then again, I suppose it really didn't -- at least, not on its own. Had it not been for the U.S. government, there is no doubt that Bank of America would have failed in 2008. There are no ifs, ands, or buts about it. Which, of course, only adds to the outrage at the bank's brazen exploitation of its customers, who, as a result of also being American taxpayers, were unwittingly forced into rescuing the very same bank that had surreptitiously taken advantage of them for years. It was a distasteful turn of events, to say the least. On top of this, while Bank of America's executives got filthy rich in the run-up to the crisis, it was the shareholders who paid the price in its wake. Thanks to egregious losses stemming from patent mismanagement, Bank of America had to issue 6 billion new shares during the past seven years, often when they trading for a third or less of book value. This is to say nothing, moreover, of the $40 billion worth of common stock it bought back at exorbitant valuations before the crisis. Taken together, these were the spark and tender that burned shareholder value down. 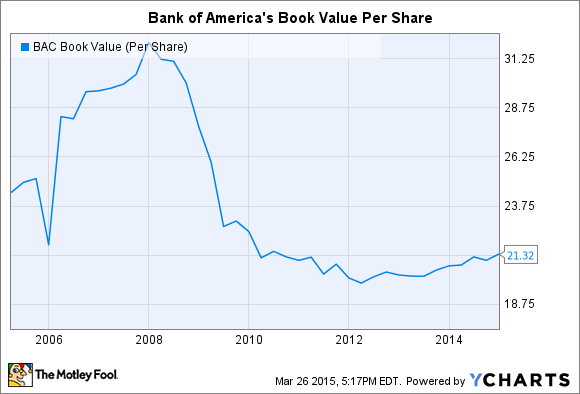 After peaking above $30 eight years ago, Bank of America's book value per share has only recently eclipsed $21 after bottoming out at $20 at the end of 2011. It's for these reasons that Bank of America must win me back -- and to be clear, I'm not referring just to me, but rather to the entire population of American citizens who have a bad taste in their mouths for financial institutions that get rich off of borrowing from us at government-subsidized rates via federally insured deposits, exploiting us through hidden fees and conflicts of interest, and then essentially blackmailing us into rescuing them with our (and future generations') hard-earned money. How can Bank of America go about atoning for its past? In short, it needs to own up and apologize for its behavior during the past decade. It needs to follow in the footsteps of Domino's Pizza (NYSE:DPZ), by clearing the air, and admitting its transgressions. Entering into multi-billion settlements is great, but doing so without acknowledging fault amounts to a pyrrhic victory, as the only people who generally see more than a negligible amount of the proceeds are lawyers, not the victims. 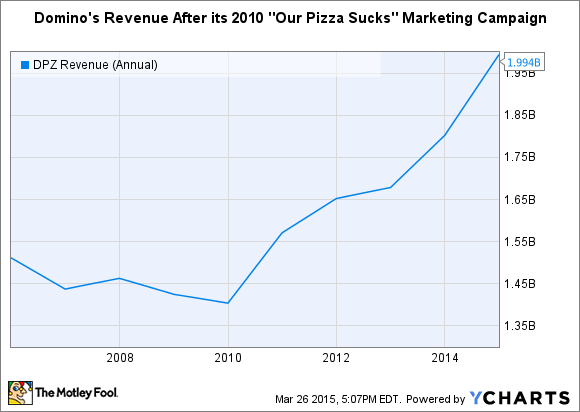 This is why Bank of America should take a page out of Domino's playbook. Five years ago, the pizza chain used a marketing campaign to acknowledge that its pizza "sucked." It cited customer complaints that its crust reminded people of cardboard, that its sauce tasted like ketchup, and that the overall product was "boring" and "bland." It showed video clips of focus groups disparaging the company. And it interviewed members of its public relations and culinary teams talking about the importance of listening to customers and improving. "Most companies hide from the criticism they're getting, but we faced it head on," one said. The net result? Domino's improved its product across the board, and saw sales soar. The inimitable Dale Carnegie wrote about why strategies like this work in his classic, How to Win Friends and Influence People. He talks about the time he was caught by a policeman letting his dog play freely in a park, in violation of the local leash law. Carnegie's strategy was to disarm the officer by immediately fessing up to the infraction. "The officer, being human, wanted a feeling of importance," Carnegie wrote, "so when I began to condemn myself, the only way he could nourish his self-esteem was to take the magnanimous attitude of showing mercy." A 2011 study about the relationship between apologies from doctors and medical malpractice suits sheds further light on this. The purpose of the study was to determine whether states that had enacted so-called apology laws, which render doctors' apologies inadmissible to prove fault in malpractice cases, saw any impact on the frequency, duration, or outcome of malpractice lawsuits and settlements. The authors found that they did, concluding that apology laws "expedite the resolution process" and "result in the greatest reduction in average payment size and settlement time in cases involving severe patient outcomes." As the researchers explained, "a main motivation patients give when asked why they chose to sue their doctors is anger; an anger that might have been assuaged by an apology." The point is that Bank of America needs to apologize. And it needs to do so not just because it's the right thing to do from the standpoint of morality, but also because it's an effective way for the North Carolina-based lender to repair its image in the minds of current and prospective clients. It's hard to fathom how profitable Bank of America would be if it was trusted and respected. Take US Bancorp (NYSE:USB) as an example. Every knowledgeable borrower I've ever talked to loves US Bancorp. It's the gold standard for commercial loans, which are the bread and butter of most banks' loan portfolios. And its profitability reflects this. Last year, the Minneapolis-based bank generated an average return on equity of 17.2% compared to Bank of America's 6.1%. Of course, there are extenuating circumstances at work here -- namely, Bank of America's billions of dollars in legal costs and settlements -- but it's those very circumstances that a public apology would be designed to alleviate. I'm aware that all of this likely comes across as a superficial solution to Bank of America's travails. And I'll be the first to admit that it smacks of naivety and an overly simplistic construct of how the "real world" operates. But the truth of the matter is that fessing up to and apologizing for one's misdeeds works. It worked for Domino's Pizza, which experienced extraordinary revenue growth following its self-immolating marketing campaign in 2010. It helped Dale Carnegie evade a citation for violating his town's leash laws. And it saves insurance companies an untold amount of money in the context of medical malpractice lawsuits. In short, Bank of America owes this not only to its victims, but also to itself and its shareholders.